Not too big, but not too small. It's just right! The Sony Alpha 7 III combines ease-of-use with a range of the latest features you expect in a modern camera. The images coming out of this compact camera punch well above their weight in terms of quality. They're the sort of images you'd expect from a full-frame camera and are made possible thanks to Sony's newly developed back-illuminated image sensor and evolved image processing system. My Menu offers instant recall of your favourite settings, so you can snap in a flash without missing a thing. Simply create and customize an optimal menu based around your preferences and be ready to shoot in no time. When you're out and about capturing one great image after another, battery longevity is crucial. The good news is that the A7 III can use an NP-FZ100 battery, which gives you more than two times the capacity of a NP-FW50 battery. This allows you to shoot up to approximately 710 photos with one full charge. 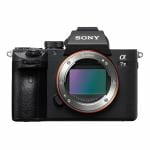 Another surprising feature of this compact camera is its speed: the Sony Alpha 7 III offers high-speed continuous shooting of up to 10 fps (frames per second). This is the video age, where the moving image is just as important as the still photograph. Yet again, the A7 III over-delivers with 4K video recording over the full width of the sensor. No more cropped video! What you get is video of exceptional clarity, colour and detail.